1. 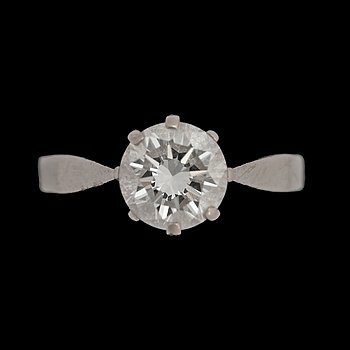 A brilliant cut diamond ring, 1.35 ct.
2. 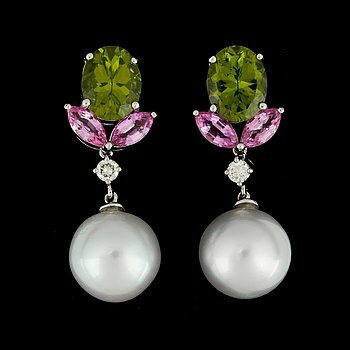 A pair of 12 mm cultured South sea pearl, pink sapphire, peridote and diamond earrings. 3. A cultured pearl and brilliant-cut diamond brooch. 4. A brilliant-cut diamond necklace. 5. A brilliant-cut diamond, 1.01 cts, ring. Quality F/ VVS1 according to HRD certificate. 6. 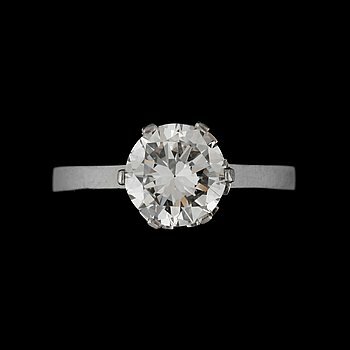 A brilliant-cut diamond, circa 1.74 cts, solitaire ring. Quality H/VVS2. 7. A diamond, circa 1.00 ct, and sapphire ring. Flexible parts. 8. 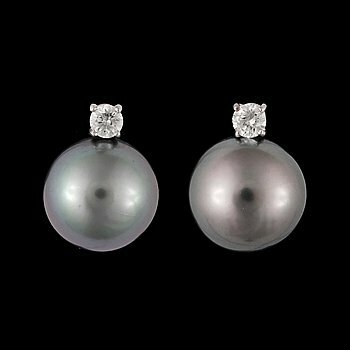 A pair of Tahiti pearl, 13 mm, and diamond, circa 0.36 ct, earrings. 9. 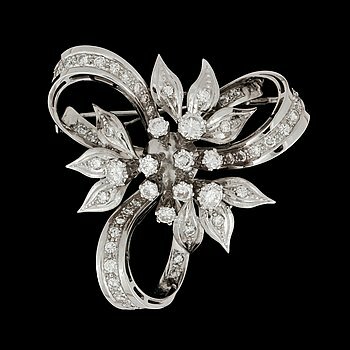 A brilliant-cut diamond brooch. Total carat weight circa 2.00 cts. 10. A South Sea pearl, circa 14.8 x 12.8 mm, and diamond, ca total 0.08 ct, pendant. 11. A tourmaline, total carat weight 16.20 cts, and diamond, total carat weight 2.99 cts. 12. A pair of cultured South sea pearl and brilliant-cut diamond earrings. 13. A NECKLACE, south sea pearls 14.3-17.0 mm. Clasp with multicolor sapphires c. 7.50 cts. Length 42 cm. 14. A pink sapphire, circa 1.55 cts, and diamond, total circa 0.7 ct, ring. 15. A pair of pearl and diamond earring. 16. A brilliant-cut diamond ring. Total gem weight 2.48 cts. 17. A pair of amethyst and diamond, circa 0.60 ct, earrings. 18. A brilliant-cut diamond, total gem weight circa 1.04 cts, ring. 19. A diamond bracelet, total gem weight circa 3.48 cts. 20. A pendant necklace in 18K yellow gold with peridot, amethyst, blue topaz, citrine quartz and pavé diamonds. 21. A peridote, 7.20 cts, and brilliant-cut diamond pendant. Total carat weight of diamonds circa 0.28 ct.
22. A Italian made gold necklace. 23. A brilliant-cut diamond ring. Total carat weight circa 0.60 ct.
24. A peridot, circa 17.76 cts, and diamond, circa 1.58 cts, ring. 25. A old-cut diamond, circa 1.15 cts, ring. Quality circa H/VS. 26. A 'collier de chien' (dog collar) necklace. Lenght 35 cm. 27. A pink tourmaline and diamond ring. Tourmaline 3.07 cts, and diamonds total carat weight 0.87 ct.
28. A pair of toumaline, circa 5.69 cts, and diamond, total circa 1.53 cts, earrings. 29. A open style tri-colour gold necklace. 30. A open model tri-color gold bracelet. 31. A pair of brilliant-cut diamond earstuds. Quality circa G-H/VS. 32. 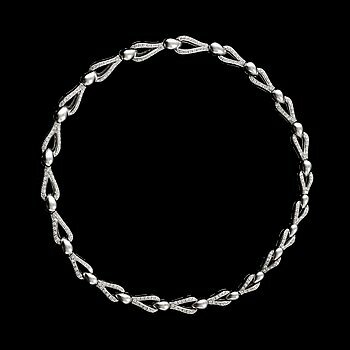 A silver, amethist and citrin necklace. 33. A brilliant-cut diamond, circa 0.72 ct, ring. Quality circa I/VS. 34. A pair of amethyst and brilliant-cut diamond earrings. 35. A princess-cut diamond and sapphire bracelet. Total diamond carat weight circa 0.70 ct.
36. Diamantgradering, A diamond, circa 2 cts, ring. Quality circa J/VVS. Flanked by pavé set diamonds, total gem weight 0.20 ct.
37. A ruby, circa 2.00 cts and diamond, circa 0.37 ct, ring. Carat weight according to engraving. 38. A pair of ruby and brilliant cut diamond earrings, total carat weight circa 2.20 cts. 39. Diamantgradering, A brilliant-cut diamond bracelet, total carat weight circa 7.07 cts. 40. A brilliant-cut diamond ring, circa 1.75 cts. 41. Diamantgradering, A pair or brilliant-cut diamond earrings, total carat weight circa 6.00 cts. 42. Diamantgradering, A brilliant-cut diamond ring, total carat weight 2.02 cts. 43. A smoky quartz, circa 60.00 cts, ring. 44. A smoky quartz, circa 65.00 cts, pendant. 45. A diamond, circa 1.84 cts, ring. 46. Sebastian Schildt, A brown diamond, circa 1.00 ct, pendant. 48. A princesscut diamond ring, circa 0.67 ct. Total carat weight circa 1.00 ct. Quality I/ SI. 49. EARRINGS, set with blue and yellow beryls, circa 18.48 cts and diamonds circa 1.46 cts. 50. PARURE, 4 pieces. Consisting of necklace, bracelet, ring and earclips. 51. DIAMANT, oinfattad, 0.85 ct, D-E/VVS, Mycket god slipning. 52. A loose brilliant-cut diamond, 0.83 ct D-E/VVS, very good cut. 53. A pair of brilliant-cut diamond earstuds. 1.00 ct and 1.01 cts. 54. A sapphire and aquamarin ring. 55. A pair of iolite earrings with cultured South sea perls and brilliant-cut diamonds, total carat weight 0.38 ct.
56. A loose brilliant-cut diamond, 0.55 ct, D-E/VVS, very good cut. 57. A loose brilliant-cut diamond, 0.60 ct, H/VVS, very good cut. 58. A aquamarine, circa 31.00 cts, and diamond, total carat weight circa 0.60 ct, brooch. 59. A brilliant cut diamond ring, 3.01 cts. 60. A 3-strand cultured pearl necklace. Clasp with a 13.80 cts aquamarine and briliant-cut diamonds. 61. A cultivated South Sea pearl, circa 14.5 mm, and diamond, total gem weight circa 3.06 cts. Quality circa H/VS-SI. 62. A aquamarine, circa 23.00 cts, and brilliant-cut diamond ring. 63. A Chopard 'Happy diamond' pendant, total carat weight 0.05 ct.
64. A brilliant-cut diamond ring. Approximately 1.75 ct in total. 65. A pair of Cartier 'Love earrings' with brilliant-cut diamonds, total carat weight circa 0.10 ct.
66. A amazonite, onyx and ruby brooch in the style of two cats. 67. A cultured South sea pearl necklace, 11 - 14.5 mm, clasp made of yellow gold and white gold with brilliant cut diamonds. 68. A pair of cultured South sea pearl earrings set with brilliant-cut diamonds, total carat weight circa 0.43 ct.
69. A pair of brilliant-cut diamond studs, total carat weight circa 2.04 cts. 70. A brilliant cut diamond ring, 0.74 ct. Made in Gothenburg 1975. 71. A brilliant-cut diamond bracelet, total carat weight circa 2.00 cts. 72. A cultured South sea pearl, 15 mm, tanzanite and ruby pendant. 73. An emerald-cut diamond, 1.45 ct, with brilliant-cut diamonds, total carat weight circa 0.50 g.
74. A tanzanite, 8.20 cts, and brilliant-cut diamond ring. Total carat weight of diamonds circa 0.58 ct.
75. 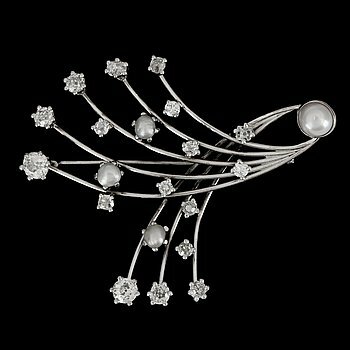 A brilliant-cut diamond, circa 0.50 ct, and single cut diamond, circa 1.80 cts, brooch. 76. A pair of tanzanite, total circa 2.95 cts, and diamond, total circa 1.00 ct, earring. 77. A diamond, circa 5.00 cts, bracelet. 78. A 2.00 cts tanzanite, pink sapphire and brilliant cut diamond ring. 79. 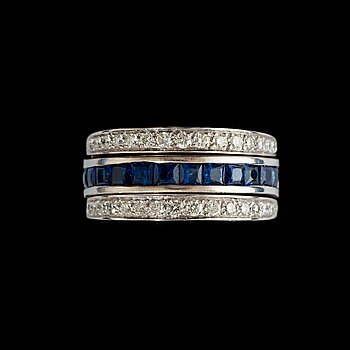 A sapphire and brilliant-cut diamond ring. Total carat weight on diamonds circa 1.75 cts. 80. A sapphire and brilliant-cut diamond pendant. Sapphires total carat weight circa 3.00 cts. 81. A diamond, total gem weight circa 2.17 ct, and sapphire necklace. 82. A checker cut aquamarine, ca 12.09 cts, and diamond, ca 0.1 ct, pendant. 83. A topaz, circa 16 cts, and diamond, total gem weight circa 0.60 ct, ring. 84. A pearl necklace. Pearl sizes from 1.5-4.5 mm. 85. A ruby, circa 3.78 cts, and diamond, circa 0.92 ct, ring. 86. A brilliant-cut diamond bracelet. Total carat weight circa 6.00ct. 87. A pair of peridot, circa 5.30 cts, and diamond, circa total 1.10 cts, earrings. 88. A pair of diamond earrings, total carat weight circa 1.50 cts. 89. A diamond, circa 2.20 cts, ring. 90. A pair of cultured half pearl and diamond, total circa 0.90 ct, earrings. 91. Diamantgradering, A old-cut diamond ring. Total carat weight circa 2.60 cts. Quality circa I-J/VS-SI. 92. A aquamarine, circa 23.00 cts, ring. 94. A coral and gold necklace. 95. A pair of briolette cut citrins, total gem weight 36 cts, and diamond, total gem weight circa 0.40 ct.
96. A citrin and diamond, ca 0.10 ct, pendant. 97. 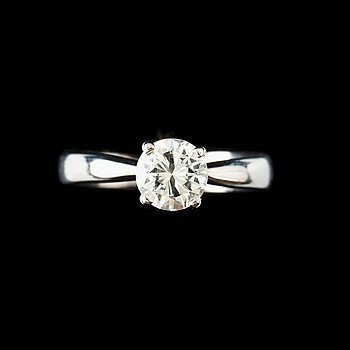 A diamond, circa total gem weight 1 ct, ring. 98. A multicolor enamel necklace in the shape of flowers. 99. A pair of single cut diamond, circa 0.60 ct, earrings. 100. A Gucci ring with checker-cut citrine. 101. A gold chain. 3.5 mm wide.